I’ve been seeing so many great organization posts this month because of New Year’s (and people’s organizing resolutions), so can we just pretend that’s why I’ve been pushing to get our master closet done? (Not because I was lazy back in the fall and had to delay the project or anything…). Either way! 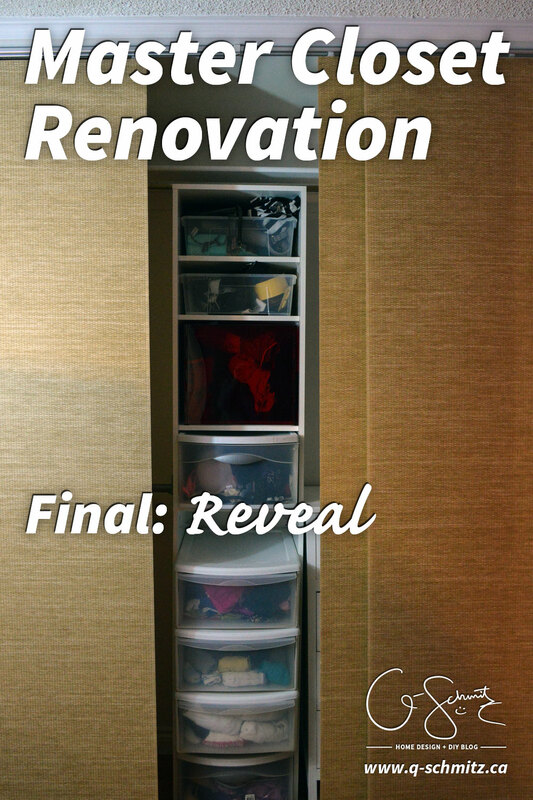 Let’s look at the master closet renovation final reveal and hopefully now you’ll see the vision that I’ve been trying to explain when I did the demo and started rebuilding. 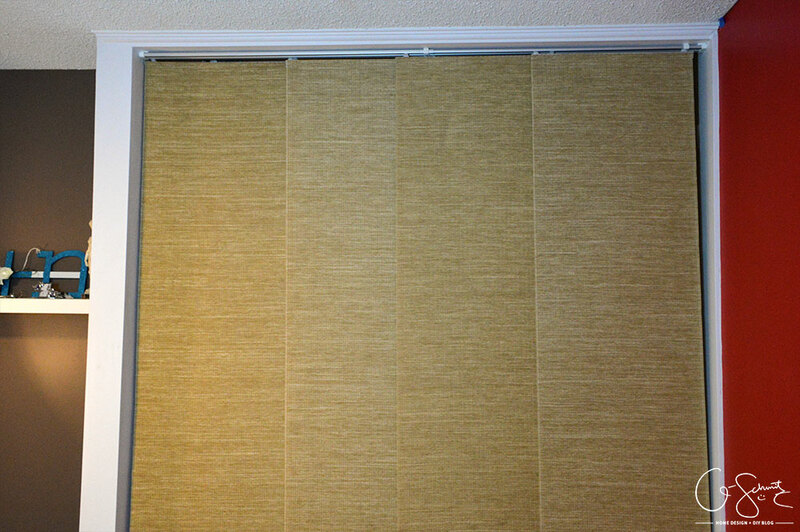 These are the curtain panels I ordered from Amazon, and they work exactly how I wanted them too! 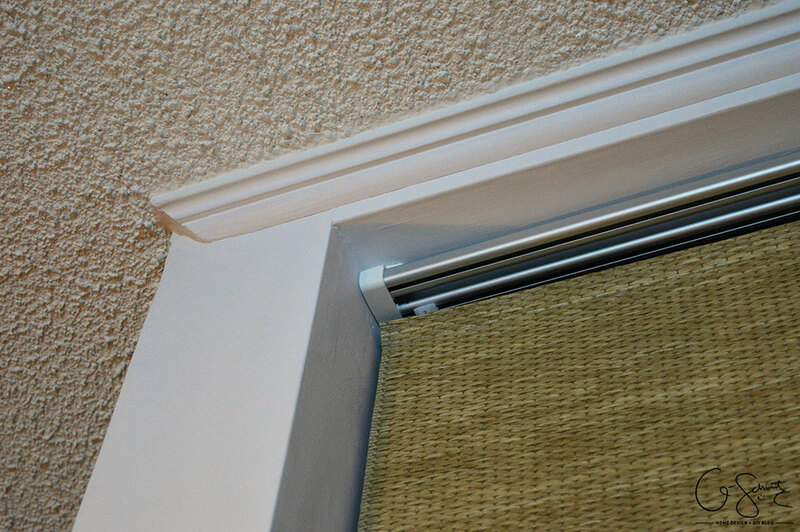 We only had to trim off 4″ from the base, and overall I think this was a great solution for us. To hide the patches caused by the demolition, I trimmed out the top and sides of the original 2×4 frame. I also added a little crown moulding along the top (and we will eventually be putting up a simple quarter round on the inside, but for now it’s bare). 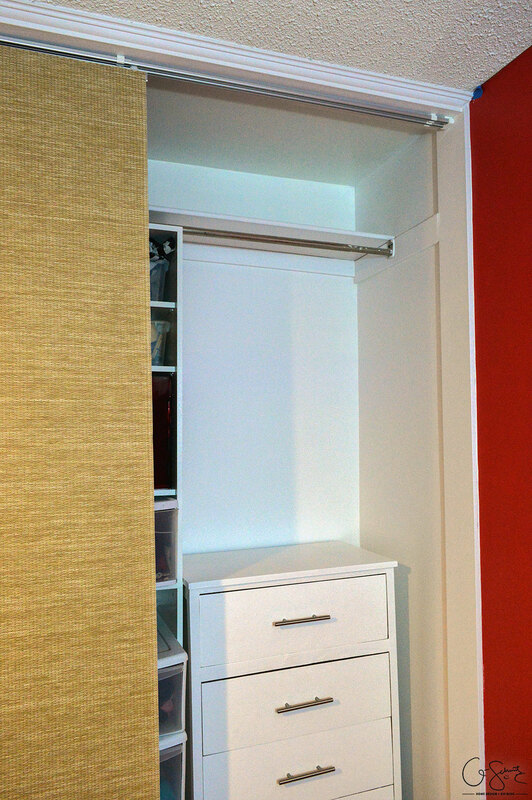 The white dresser fits in perfectly on the left side of the closet, in between the original center storage unit and the wall. I realized after putting the panels up and the dresser in, that our walls/floors in here are not level at all! I moved the half-rod to the left side and tucked it behind the vent. 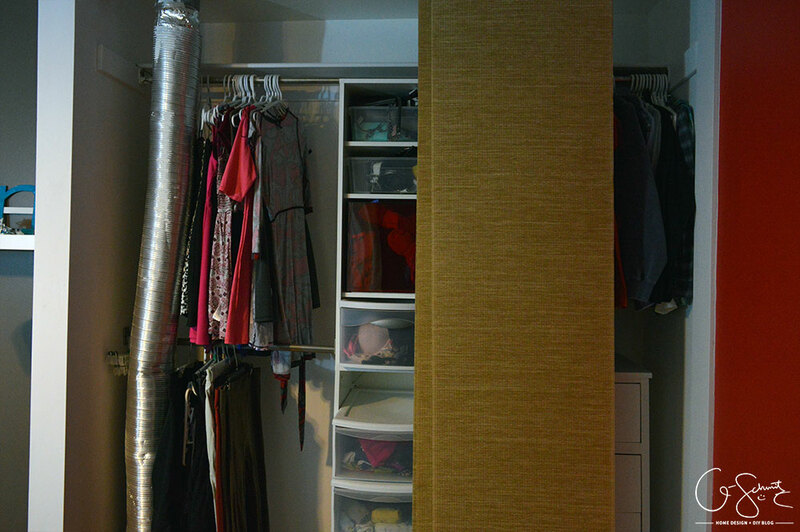 The Husband says the vent takes away from our new closet and we should have just taken it out (I didn’t want to chance it; obviously it was in there for a reason!). I really like how I can move the doors/panels however I want, so I can still have full access to the center part (which, if you remember, would have been a limitation by installing normal sliding closet doors). 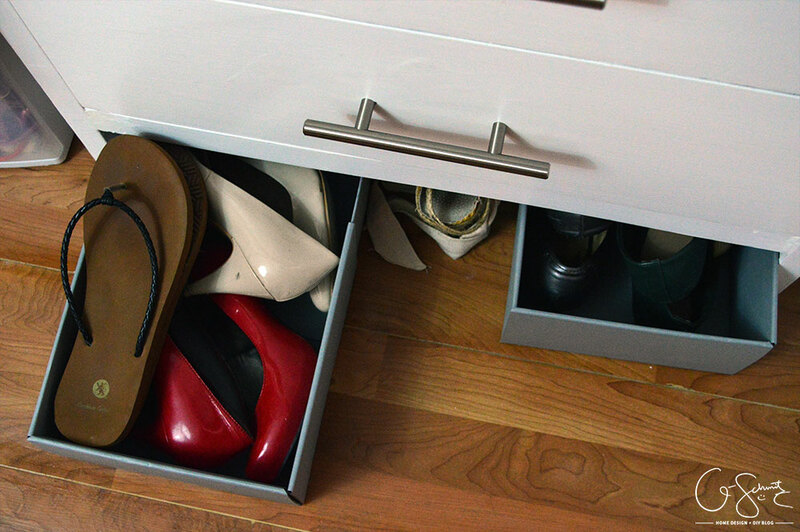 Under the dresser (because I took off a wood piece), I was able to add a couple of Ikea extendable storage boxes for my shoes. I patched up the hole in the laminate floor as best as I could, so stay tuned for a future post on how I did that! 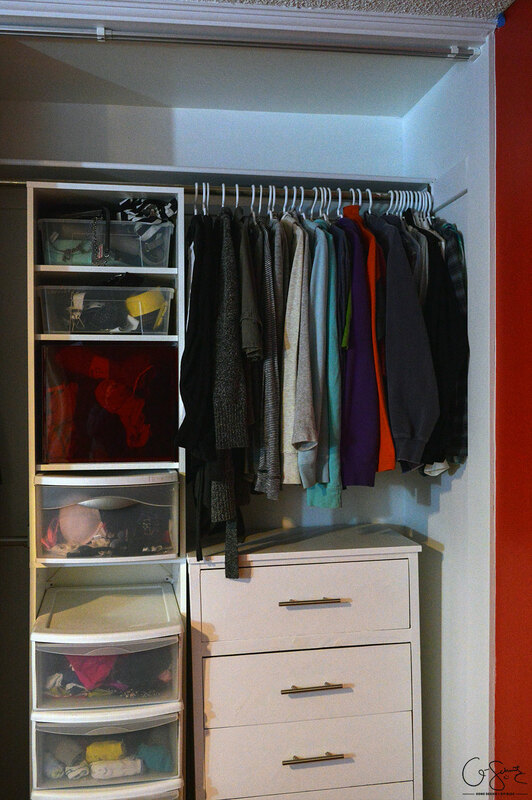 I can finally bring my clothes back in our closet from the Pink Room; but I haven’t filled up my dresser yet. I’m looking forward to actually using that top shelf for my craft supplies (again, they are currently in the Pink Room closet). 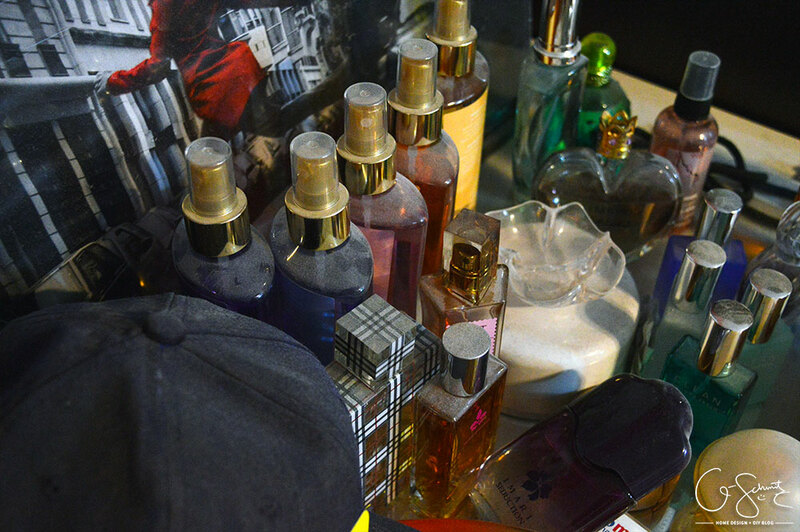 I want to do a big cleanup of that area so figured it was easier to clean and organize them before putting them away. I’ll be honest, the rest of our bedroom is MESSY! 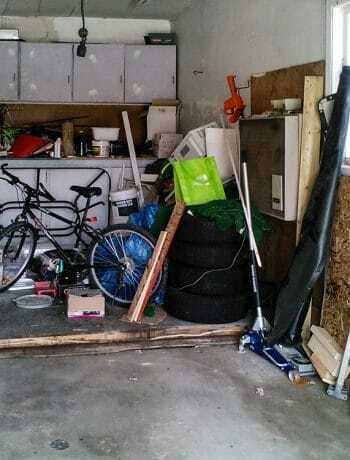 I’m going to clean off all surfaces of drywall dust, and do a huge purge of the Husband’s things when I have some free time. 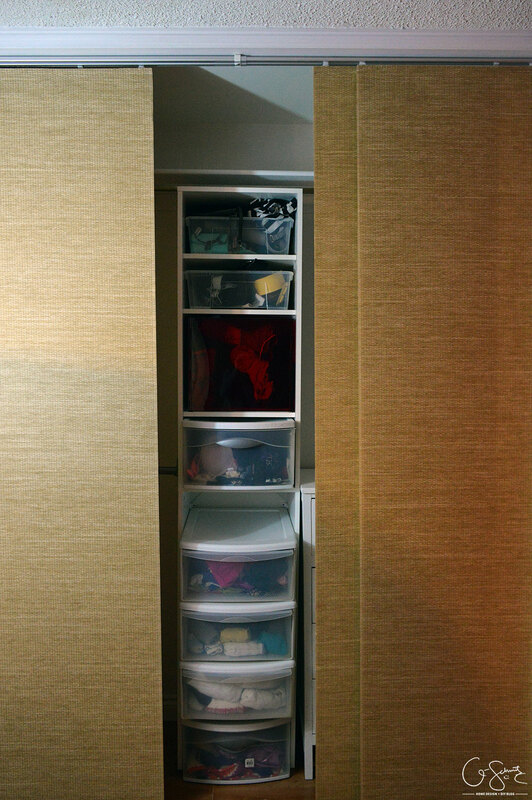 Just a reminder though, the whole reason for starting this closet renovation was to regain some floor space in our bedroom and get rid of as many dressers as possible. Currently, the Husband’s things are taking up a dresser and a wardrobe – but I will be moving them to the closet and the white wardrobe when my things go in the new closet dresser. You can see the best overall pictures of our bedroom here. 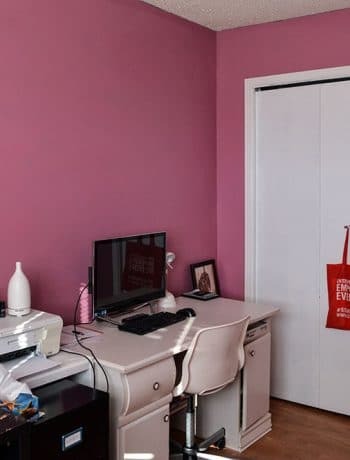 Although it looks like we got most of our master closet renovation to-do list accomplished, we still have to fix the baseboards, finish the floors 100%, add the piece of quarter round to the inside of the closet, touch-up a bit of red paint and then clean our stuff and bring everything in! I’m giving myself a break from the bedroom for the next little bit to focus on some other projects (okay, and the Husband said I couldn’t organize his clothes until I was on maternity leave… which won’t be for a while), so come back next week when I finally reveal what our basement currently looks like (dun dun dun – cue dramatic music)! I’m curious as to where your dryer is located?? 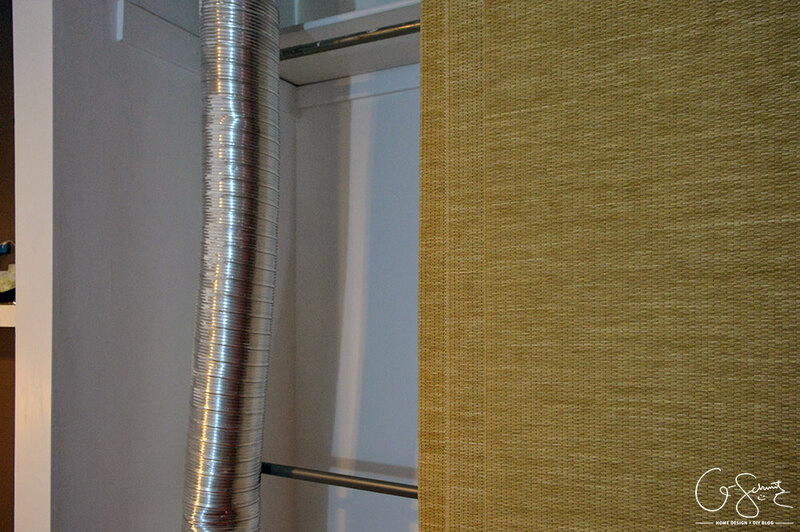 The dryer is underneath the bathroom (and its vent goes directly outside through the wall). This one is just a duct that goes from a basement vent out through the attic/roof. 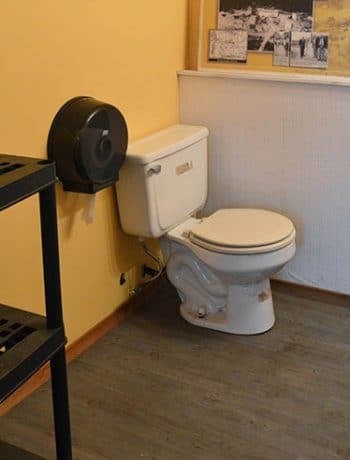 I think to take out any heat from the basement?